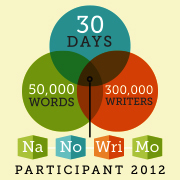 NaNoWriMo (National Novel Writing Month) ended yesterday, and I am so pleased to have “won” it again! I finished my 50,000 word novel in time, hitting 50,288 words at about 2:30 p.m. November 30th – with hours to spare. HOURS! For most of the year, I diligently aim for balance and moderation. For example, balancing work and health (or, at least, attempting to) is the only way I can manage several projects at once. I take time to exercise, etc, giving myself energy to work fast enough to have time left over for exercising, thereby giving myself energy to work… it’s a nice cycle. However, half-way through the month of November (otherwise known as “National Novel Writing Month”), I start to change my tune. As the days dwindle and the EXPECTED word count outdistances my ACTUAL word count, I start to not even care about balance. Let alone, moderation. In fact, by now, November 20th, I am figuratively wadding up my revered ideals and tossing them out the window, because I’ve arrived at my favourite part of NaNoWriMo. Now, eyes fixed on my word count and deadline, I am allowed, encouraged, even expected to forget about balance for a bit. For the last 10 days of this wonderful, flat-out busy, tumultuously creative, “no, I can’t do the dishes, I’m writing” month, I get to tip the scales towards an excess of two of my favourite things: writing and coffee. A 2012 Participant, R.D. Girvan hopes to bat 1000, earning her 4th NaNoWriMo win. My friend Natasha Deen is a terrific writer who is also participating in National Novel Writing Month (NaNoWriMo). This is an annual contest where over 300,000 writers from around the World must write a 50,000 words novel within the 30 days of November. It’s like a marathon: cross the 50,000 word finish line and you win. If you’ve experienced me NaNoWriMo-ing before, this will sound familiar. Even the kids have heard this so often about NaNo that when I say, “I am so behind…” they are not alarmed or distressed. They just smile and nod. One year, I still had about 10,000 words to go and only 2 days left to do it. That’s the year I got my scar: I slipped on a front walk and cracked my chin open on a concrete step. In the process, I sprained both wrists while trying to break my fall. After returning home from the hospital (6 surface stitches and 2 deep tissue), I noticed that my wrists were starting to stiffen up. I figured that if I went to bed, they would seize up entirely and I wouldn’t be able to type the next day. So I stayed up until I was done, hitting 50,002 words at about noon on the 30th.